Plot – Teenager Carly (Winters) and her younger brother Josh (Arthur) must work together to survive their murderous parents Brent (Cage) and Kendell (Blair) after an unknown cause sends parents on a plight to kill their children. It’s not often you’d say this about a film that’s central premise revolves around parents wanting to hunt down and violently murder their children, but Mom and Dad needed to be a little more crazy and unhinged to make its downright bonkers plot click. Directed by one half of Crank directing duo, Brian Taylor, Mom and Dad is far from your typical movie going experience in many ways and serves up some juicy black comedy goodies in amongst its horror/thriller elements but it never takes its out there premise far enough as we are instead treated to a more generic “trapped in a house scenario” that is saved from tedium by a joyously unhinged Nicolas Cage performance that is a sure-fire new addition to the Nicolas Cage anti-terrorism alert system. Teaming up with Selma Blair as his on-screen wife Kendall, Cage plays one time petrol-head turned more mild mannered white collar working Brent, whose pent up rage and resentment towards his life is fully unleashed when a virus/outbreak of unknown origins turns loving mother’s and father’s into murderous maniacs as our leading man goes full “Cage” in his performance. With a psychotic glee in his eye and a wide spanning smile, Cage has a blast bringing Brent to life and while its far from what you’d call a “good” performance, there’s an odd and satisfying feeling from getting to see Cage unleash such an unhinged creation and with that, some of the year’s most memorable and off-kilter scenes, with a pool table dismantling and a run in with Lance Henriksen the highlights. His clearly having a great time with the whole silly affair and perfectly encapsulates just what a film like Mom and Dad needs to take its insane premise to the next level. 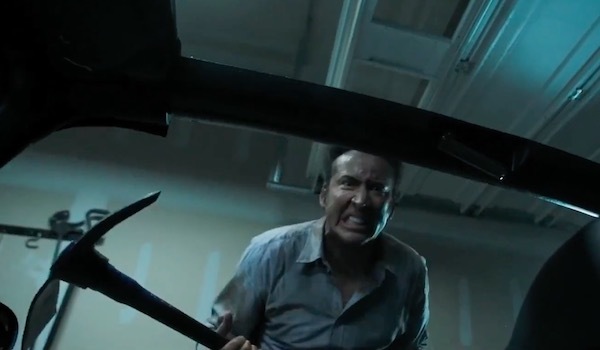 If Mom and Dad had truly joined in with Cage to match his same amount of intensity and craziness, it might’ve become a genuine cult-classic but as it stands this idea and its inception feels rather half-baked and as the film wears on and thinner over a period of a brief 80 or so minutes, you can’t help but feel Mom and Dad missed its chance to make its mark. There’s fun to be had here, thanks largely to a Red-Bull infused Nicolas Cage taking matters into his own hands, but this seemingly blood filled black comedy never completely commits to its high-concept idea, as we are instead treated to a rather generic and increasingly boring home set thriller in its latter half. I enjoyed it an agree that it needed to be more bonkers. Loved the little cameo by Lance Henrikson. Thought the film was good but with it being directed by Brian Taylor i felt it was holding back. Yeh I felt the idea should’ve gone a little more over the edge, it started out that way but then became a really generic thriller of sorts. Still crazy Cage is always good fun!